How to Apply Online for GATE 2019 Exam? 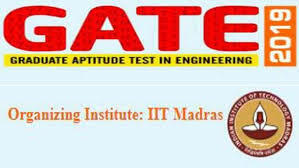 Online Application Process: This year's GATE is conducted by IIT Madras. The eligible candidates can apply for GATE 2019 through online only. Online Registration: GATE Online Application Processing System (GOAPS) is a portal through which one can register online for the examination. It is available on the GATE 2019 official website at appsgate.iitm.ac.in. Documents: The candidate will have to upload his/her photograph, signature and other documents like qualifying degree certificate/ certificate from the Head of the Department/ Institute (in the format given in Appendix A) and category certificate (SC/ ST/ PWD) and/or Dyslexic certificate, if applicable. Details submission: For registration, a candidate has to provide his/her Email ID and mobile number. After which he/she will be provided with a password that he/she can use to log in and out of the GATE website. Personal information: The next step would require candidates to add their education and personal details. Candidates can preview the GATE 2019 form that was filled, to make sure there are no errors made on the application form. And finally, candidates can pay for the application form through online. Step 2: Enter the personal details such as Name, Email Id, Country as in the original documents. Step 3: Create your password and it must contain at least a single string of numbers or alphabets. It should be unique with 8-15 characters long. Step 4: Enter the Captcha provided and click 'Submit' for completing GATE Registration. GOAPS password must be unique. It is advised to avoid using Date of Birth, your name or some numbers (12345 etc) or string of letters (abcd etc). After successful registration, an email containing the GOAPS Enrollment ID will be sent. This ID will be used for submitting GATE 2019 Application Form, downloading GATE Admit Card and for the purpose of checking results and downloading scorecard. Enter the Enrollment ID and Password to proceed with GATE Application Form filling process. Go through GATE 2019 Information Brochure and read all the important instructions to succesfully complete the GATE application form. The candidates can choose GATE 2019 papers as per their wish. After this, the candidates can select their GATE 2019 exam centres. Each candidate has the provision to prefer three cities as exam centres. While selecting the exam cities, the first two choices must be of same GATE Zone and the third one can be from any sector. Add your Correspondence address for future communication. Enter the correct Pincode/ Zipcode. Verify the details with the Institute’s certificates and enter in the space provided. If you don’t see your college name in the drop-down list provided, then type the name completely without any special character. The length should not exceed 100 characters. GATE Application Fee is different for Indian candidates and International candidates. The payment can be made via Credit Card/ Debit Card/ Net Banking only. E-challan mode of payment has been eliminated from the GATE registration process. Correction: GATE Form Correction enables candidates to edit or modify any incorrect information filled in the GATE Online Application form. Step 2: Enter the GATE Roll number and Password - Fill your Login Credentials - GATE 2019 Registration No. or Enrollment ID and Password. Step 4: Link for Correction - A new screen will appear and there you will see a link relating to ‘GATE 2019 Form Correction’. Step 5: Make valid Corrections and save - Click on the link and make the required corrections and then save the details. I have recently submitted the request for updation in Aadhaar details (including biometric updation), however, I am unable to apply with the updated Aadhaar Card Details. What should I do? Such candidates have to apply for JEE Main 2017 by entering 14 digits Aadhaar Enrolment ID/UR No. (Including slash) printed on the slip issued by aadhaar centre after submitting updation request. What is the Application process for the GATE 2017 examination? The application process for GATE 2017 will be online only. Candidates can fill the form for GATE 2017 online via GOAPS-- GATE Online Application Processing System. There are several stages for the application process to be complete. Begin with registering yourself on the website for GATE. A password will be created after you fill in the email id and contact number. Move on to adding details about education and personal stuff. Preview the filled in form of GATE. Post confirmation for submitting the GATE form, no changes will be made. GATE has a reservation policy by means of which seats will be reserved for candidates who are part of the underprivileged social classes including Scheduled Caste, Persons with Physical Disability, Scheduled Tribe and Other Backward Classes. Does GATE provide reservation policies to candidates from suitable backgrounds? I want to make online payment but by mistake I selected e-challan mode and then this message was shown :"e-Challan Payment made. Your payment has not yet been received by GATE-2016. Take a printout of the challan and deposit the amount in State Bank of India. Check your payment status after 72 hours of depositing the amount" Can I do the online payment now? What should I do now for making an online payment? you are advised to go through with the e-challan payment or get in touch with GATE Officials for an answer to this predicament. The board will get back to you. Check your application status and see if they have given any rectifications to make. Else if your application shows successful you don’t have to worry. Will the certificates scanned by cam scanner be accepted or not? Yes, certificates scanned by cam scanner are accepted.